Chocolatier Santi Falcone plans to make his wife a sinfully decadent Valentine's Day treat: a Galliano truffle with a cream filling that features the sweet Italian herbal liqueur. "My wife, Marisa, likes Galliano, so I'll make a special flavor for her only," says Falcone, proprietor of Dante Confections. "By law you can't make a truffle with more than 1 percent alcohol, but it's a special concoction that I'll make just for her. And like everything I create, it comes from the heart." Valentine's Day is one of the busiest holidays of the year for Dante Confections, a wholesale and retail confectionary tucked into a strip mall in Billerica. Behind the small storefront, Falcone oversees a busy gourmet chocolate operation that creates 26 truffle varieties, including the newest, passion fruit, as well as amaretto, Grand Marnier, and champagne liquor truffle - "legally edible, of course," says Falcone. The family operation also produces oversize peanut butter cups and pecan nut oysters, "made with a private mix of chocolate and secret ingredients concocted in our kitchens," says Falcone. But truffles were the furthest thing from Falcone's mind 20 years ago, when he made the abrupt career switch from making handcrafted pianos to chocolates. As owner of Falcone Piano Co., the piano technician, designer, and builder decided it was time for a change. He settled on his new industry through the process of deduction. "I spent two weeks at the Boston Public Library, researching what I wanted to do, and boiled it down to either bottling water or making chocolates," he said. "I wanted a business that is relatively recession proof, and that's how I ended up with chocolate." His first truffle, made in his home kitchen, amazed his family, although the amateur chocolatier was already greatly praised by friends and relatives for his home cooking. "It took a lot of experiments and adjusting to get good at it," says Falcone. "Making truffles is not as easy as it might seem." Today he produces thousands of truffles each month, carefully melting 100-pound blocks of chocolate in tempering machines that heat and cool the chocolate until the mixture is the proper consistency. 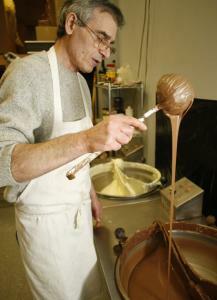 "A good chocolate should melt on your tongue and have a rich, deep flavor with a silky texture," Falcone says. What's your favorite kind of chocolate? I like a 98 percent cocoa bar that I've created that has no sugar in it, it's bittersweet and can better your health. I have to be blunt: Sugar is not healthy for you, so if you can eliminate the sugar and still have the chocolate, it's very good for you. Chocolate is full of antioxidants that can help prevent heart disease and cancer. I also like the espresso truffle, which is out of this world, and the Jamaican rum truffle, which has a really intense flavor. How do you develop new flavors? Pomegranate is really hot now, so I'm trying to create a pomegranate truffle; but I don't like the taste and consistency yet of my creation, so I still haven't done one yet. But I've made tiramisu and coconut and many others. I'm very fussy, so it takes months and months of sampling in small batches before I will release a new flavor. How do you make the cream-centered fillings of the truffles? I'm sure you've had a chocolate and bit inside, and then tasted the cream center, and wished you hadn't eaten it. Ingredients and flavoring for the creams are very important. We use no chemicals, and I get a lot of my flavorings from Europe, especially Italy, my native country, such as flavors from Fabbri, a well-known purveyor of products and syrups for desserts. Have you gained weight from tasting so much chocolate? No, people always wonder how I stay so thin. I'm 5 foot 11 and 160 pounds. I think my secret is I get up early in the morning, 4:30-5 a.m., and am very active all day, making chocolate. Do you ever get tired of all that chocolate? I'm around chocolate all day long; when you melt chocolate, the fumes get into your clothes, so your clothes smell of chocolate, too. Chocolate can squirt everywhere, it goes on my apron, and all over the place. In fact, I reserve Fridays just for cleaning up the shop. We spend the entire day wiping down the machines, cleaning the refrigerator, mopping the floors, and cleaning the counters. Chocolate aside, what else do you like to cook? I was born in Sicily, and I can cook the best Sicilian meals, just like my mother and father, God bless them. My leg of lamb with potatoes, done in the oven, is better than the best restaurants'. Everyone looks forward to me making this around Easter time. How much can someone earn as a chocolatier? Our large truffles sell for about $2 to $3 each, and we do a lot of wholesale and custom orders. I'm making a nice living. What else goes into making the chocolates? They need to be packaged and shipped out, as well as handling the marketing and the sales. All the things that people don't think of; they just think it's a sweet business, which it is, of course. So chocolate has proven to be a recession-proof career? Yes, even when times are bad, everyone still buys chocolate. Valentine's Day is right around the corner. Is chocolate really an aphrodisiac? You'll have to ask my wife that question, after she eats the truffle I make for her.